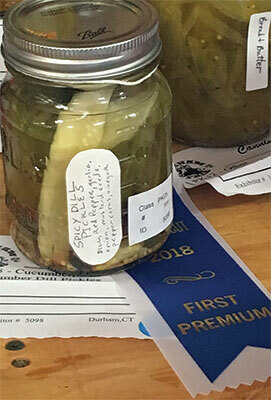 ME’s Blue Ribbon Spicy Dill Pickles | TFI Envision, Inc.
Durham, CT — The Durham Fair is Connecticut’s largest agricultural fair with nationally-known country music performers, thousands of exhibits, a midway, and lots of food. A truly authentic country fair. One of the annual contests is for homemade pickles. And we have a Blue Ribbon Winner right here at TFI Envision with our Vice President, Mary Ellen Butkus . She has won every time she has entered – sometimes winning first, sometimes second, and sometimes third. Her recipe for success varies each year, but it starts out with a basic dill pickle recipe and then she adds her secret ingredients to make them winners. Congrats ME!